Worry about the critics? Wonder if you have something unique and original to share? Learn tips on how to crush your fears, find your voice, and be authentically confident. Why “thinking your audience is naked” is not good advice. 00:01 You are listening to Steal the Show with Michael Port. I am Michael and I am honored to have you here. 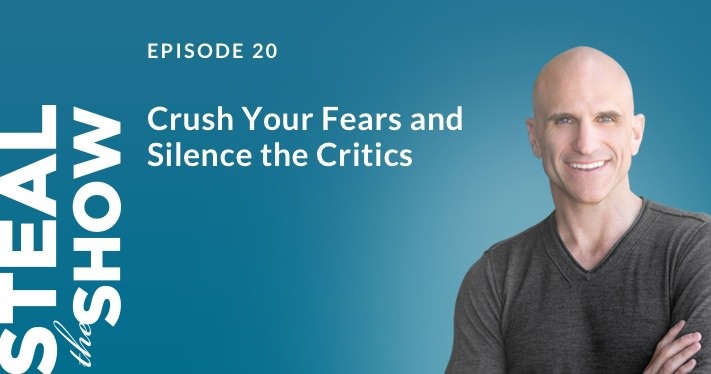 And this episode is about crushing your fears and silencing the critics by finding your voice to be authentically confident. And remember, this episode and all of the episodes are based on my book, “Steal the Show” and you can get it anywhere books are sold. But you can get it with a whole ton of bonuses: Live event free tickets, templates, tool kits, video training and so much more at stealtheshow.com. That’s stealtheshow.com. 00:43 Let me ask you a question. Do you ever feel unworthy of the moment? Do you ever question whether you deserve to be in front of others? Do you question whether what you have to say is unique and original? Do people care to hear it? Today, I wanna give you tips on finding your voice because the most common missing element in the thousands of presentations and performances I’ve witnessed is the speaker’s true voice. But finding your voice can be a difficult proposition for many people in business and life, even for those building careers as top executives, thought leaders or performers. But finding and trusting your voice matters. 02:20 And here’s another example. A client of mine was on another broadcast TV program, and it was an all-day broadcast. And during the first segment, she was telling a lot of stories about her past, her origin story and more. And of course, I watched. And at the break, she texted me. She says, “How am I Doing? Am I doing good?” You notice how this question about doing good keeps coming up? And I said, “Well, yeah. But can I give you a note?” She said, “Of course. Please, please.” I said, “Stop apologizing for yourself.” She said, “What do you mean?” I said, “Well, each time you tell a story, you give yourself an out. You say, “Here I go, I’m gonna share again” or “I’m so sorry for talking about myself, but let me just tell you.” And I told her that they chose her because they want her to share. Her story is what is important. That’s why she’s there. 03:37 Research has shown that women, interestingly enough, tend to apologize more than men. Two studies by the University of Waterloo in Ontario, published by the Journal of Psychological Science in 2010, found that while men are just as willing as women to apologize, they have a higher threshold for what they feel they need to apologize for. Think about that for a second. So, my client agreed to try dropping the unneeded apologies. And we talked about how anyone, including the two of us, can get caught in the perfection trap, wondering if we’re worthy of the moment in public speaking or say during the interview process for a new job. It’s easy to get distracted and start questioning yourself. Well, what can I say that hasn’t been said? What can I do that hasn’t already been done? Why should I be here rather than someone else? 04:38 But here’s the thing. You don’t need to be different to make a difference. You don’t need to be different to make a difference. Letting go of thinking that you don’t have enough to offer is an incredibly rewarding aspect of what I’m trying to share with you. It allows you to embrace your gifts, so you have the confidence and natural conviction that you can get results from your performances and your speeches. So, even if you’re saying something that’s already been said, it’s your voice that matters. As I said, you don’t have to be different to make a difference. Think about it. How many mothers sing the same lullabies to their children? A baby doesn’t care half as much about the song as she does about the sound of her mother’s voice. 05:34 And too often, when we’re given the opportunity to be in the spotlight, we get scared and we lose the sense of being authentic. Instead, you play at what you think a person in that situation is supposed to be like. And as a result, you believe you’re an impostor. But learning to be yourself when you perform while also embracing the fact that you can be a chameleon who plays lots of different roles with different styles of behavior. Well, if you do that, you’ll become a powerful performer and a speaker, if that’s what you wanna do. And I know it sort of seems like a contradiction but this idea that you can be a chameleon and yourself at the same time. You know, F. Scott Fitzgerald, of course, and he said that, “The ability to hold two opposing ideas in your mind at the same time and still retain the ability to function, well, that’s the sign of a well-developed intelligence,” and I suspect that you have that ability. So think about it this way, a chameleon is authentic, 100%. 06:40 A chameleon is 100% authentic. If they’re on a green leaf, well, they turn green. If they’re on a red leaf, they turn red. They’re not pretending to turn green or pretending to turn red, they actually do it. And if you wanna be successful as a performer in all aspects of life, then you need to be able to adopt different styles of behavior. You need to be able to play the right role in every situation and that means playing different roles in different situations. So let go. Start to let go at least of this idea of who you are because as a result, you may find who you really are, because we wrap ourselves up in these fat layers of persona. We think that they are armor that protect us from the critics, but they’re just parchment-like armor. It’s very easy to poke right through them. 07:44 So sometimes, finding our voice is more about letting go, stripping away, than going out in search of something because when you feel confident, when you feel like you are authentic, well then it’s hard for people to hurt you. It really is. They can say whatever they want. I mean you can write a really nasty review about me but I don’t know you so I’m not gonna take it personally. I’m just gonna do my best job to be of service to you and to others, and I’m going to focus on that, being helpful. I’m not gonna focus on being good, I’m just gonna focus on being helpful. And here’s the thing, there are two types of critics, critics in your head and the critics out in the cheap seats, the people who push others down to lift themselves up. And you hear those critics out in the cheap seats more and louder when the critics inside your head, the voices of judgment, are shouting at you. But if you can start to silence those voices of judgment in your head, then you do not hear the critics in the cheap seats quite as much. So what can you do to silence those critics? As I said earlier, number one, you can focus on being helpful rather than good because when you focus on being good, you are focusing on your own needs. It is a self-absorbed, self-obsessed perspective and the more absorbed you are in self, the more anxious you get in the spotlight because you feel like other people are judging you, because you are judging yourself so critically. 09:51 So let go of your need for approval and ask yourself, what’s more important, results or approval? What is more important, results or approval? Because if you’re going after approval, that’s a dangerous, dangerous proposition. That’s a dangerous role to play, the need for approval, the approval seeker, especially when you’re trying to perform. But if you just focus on results, then you can focus on what to do to produce those results not trying to get approval. And so each day, I suggest you ask yourself, what’s more important, results or approval? There’s some important behaviors that open the way to freeing your voice and finding a sense of self-esteem and self-possession as a performer in all aspects of life. So number one, find out what it takes to discover your back story and keep your promises to your audience, whomever and wherever that may be. That could be one person or it could be 1,000 people. 13:13 Which I think has to be the stupidest advice I’ve ever heard in my life because first of all, if you’re up there thinking about the audience naked you’re not focusing on your objective. You’re thinking about something else. And number two, isn’t that gonna make you a little bit more uncomfortable rather than less uncomfortable and I think the reason we get so anxious in front of others is because being exposed can be really scary. Rosalind Russell the famous actress said that, “Acting is like standing on a stage naked and turning around very slowly.” And that’s what it’s like when the eyes are on you. It can be a job interview, it could be a negotiation, it could be a speech in front of others. But all eyes are on you and when you think you have to protect yourself from getting hurt from the power of others to adversely effect your life, well all you’ve really done is repress your dreams. 14:14 You’ve wasted your voice on self-protection rather than amplifying it through self-understanding followed by self-expression. All that negativity makes you weak, your voice is strong when it’s founded on generosity and dare I say it, love. So finding your voice and speaking up probably shouldn’t be a rebellious act, it’s empowerment, it’s not revolt, it’s not a response to something. It’s not, “I’m gonna show them just watch me.” To rebel is an act fueled by scarcity. It’s a small voice shouting, but finding and sharing your voice is about creating something new, not simply complaining or rebelling against something in the past. The exciting performer breaks the rules, not just to be rebellious, but to create something new, something that works better than what currently exists and to delight and surprise, and move and inspire. 15:14 The act of tearing something down without rebuilding something better in its place traps us in the past rather than freeing us to experience the rewards of the future. So silence the critics, crush your fears, and find your voice. 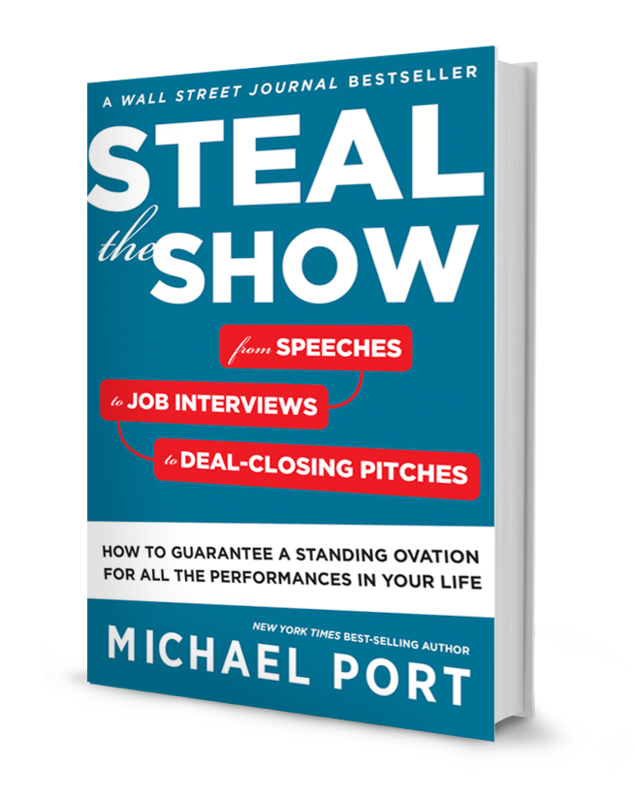 This is Steal the Show with Michael Port. I am Michael, and I thank you for listening. Now go buy a copy of “Steal the Show”. You can get it anywhere books are sold but you can also get it with a whole bunch of bonuses at stealtheshow.com. That’s stealtheshow.com and keep thinking big about who you are, and what you offer the world. Bye for now.